Plot: On his way to work, Bill Foster gets stuck in a traffic jam so decides to abandon his car and walk home. But when a Korean convenience store owner overcharges him for a can of Coke, the mild-mannered Foster erupts into violence. Picking up a bag of assault weapons dropped in a drive-by shooting, Foster walks across the city violently venting his frustrations with the petty rule-makers and the lazily self-interested who make his life a misery. "Where the hell are you going mister?" "Going home" is that what the film is all about, you will ask yourself. But the next sequence with the Korean shop-keeper will prove to you, it is not after all just about going home. Although this film received a lot of flake from various minority groups particularly and quite understandably from Asian-American communities, and was decried everywhere as a wholly irresponsible pandering to the redneck element of audiences. But what it seems to me that critics and film goers were just scratching the surface because at no time of the film, I could distance myself from the main character. 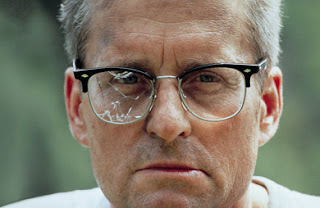 Michael Douglas manages to reveal such an inane character of the ordinary that, you would empathize with him even after he takes out the bazooka and fires at the construction site. This film doesn't only speaks out the urban reality, it takes snipes at homo-sexuality, freedom of expression, mass consumerism and of course justice. The relationship he shares with his wife and daughter will reveal the unnerving side of Michael Douglas and only then, you will start realizing that he is not ultimately the average guy you were identifying yourself with for so long, he is actually a nut case pretending to be an average guy who snaps. He is not under any cathartic attack whose duty today is to show you the real state of a average hard working guy who is meted out puffed hamburger when the menu shows a fat over sized one or how America used to be a free society allowing various communities across hundreds of different nationalities giving them equal opportunity. But then, what is this film all about? These are questions that Michael Douglas character 'D-FENS' manages to raise? On the other hand, we have Michael Duvall at his very best, trying to wade thought his last day of premature retirement. The film is harsh and unforgiving, if the filmmaker wants a take a snipe at "equal opportunity" given to the blacks, it does so without any grimace, while it shows an Indian selling a gift to 'D-FENS' in that very street. The climax is believable and understandably so, as the past of D-FENS is revealed to us in stages, we don’t feel remorse at the end, as it a character we identified in the beginning and disowned towards the end. So, you betray D-FENS in the end and do feel guilty about it too. That is the mastery of the script and not to mention Michael Douglas. 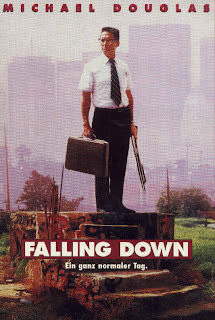 He is brilliant and "FallingDown' is a film, I guess every filmmaker wants to make, make a passing statement on everything you hate, even if you looking through a cheap telescope and very sure that the stars might be in the wrong constellation. Make a note...and let the believers in you feel the guilt at the end. Absolutely marvelous pretense of a great movie...still it managed quite well in doing that so.